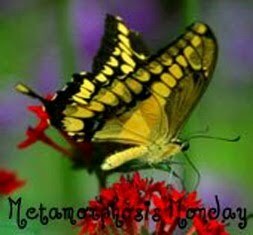 Welcome to the 183rd Metamorphosis Monday! Greetings! How was your weekend? I was out of town this weekend but while away I read all the wonderful, heartwarming comments left on the post about how I came to find sweet Max. Thanks so much for sharing your stories about your fur babies. After such a sad, difficult weekend in the news, it helped so much to read your uplifting stories. I really needed that this weekend, a reminder there is good going on in this world everyday, not just the bad that we hear on TV. Could you use some encouraging, uplifting thoughts and stories, too? Click on the post titled, A Story of Adoption and Healing and scroll down to the comments. Beautiful, loving souls visit BNOTP and there’s proof in each comment. Thank you for all you share! Suzy, who blogs at Worthington Court recently shared pics with me of her wonderful bedroom makeover and it included beautiful buffalo check curtains she made herself. Suzy came across her check fabric for just $3 a yard! Awesome deal! 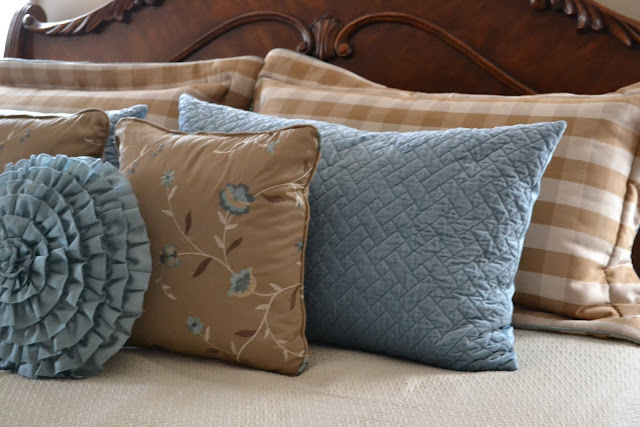 She bought more than enough to make curtains and decided to also make matching pillow shams, too. 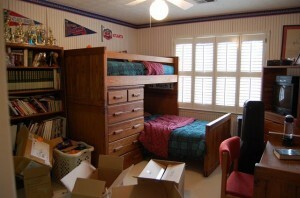 Here’s a Before photo of Suzy’s bedroom. 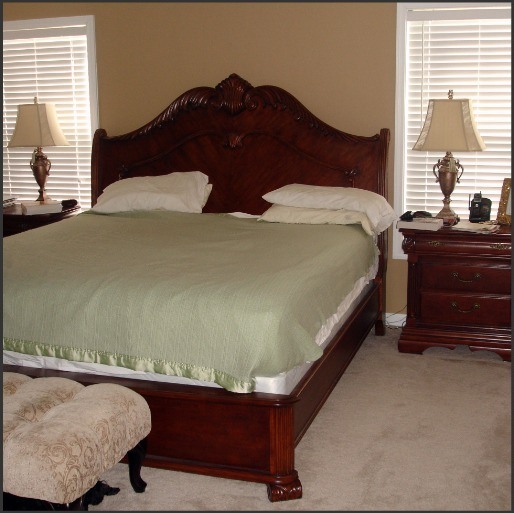 The bed was simply dressed and the windows were bare except for blinds. Check out the After! Beautiful! Do you see the buffalo check curtains? 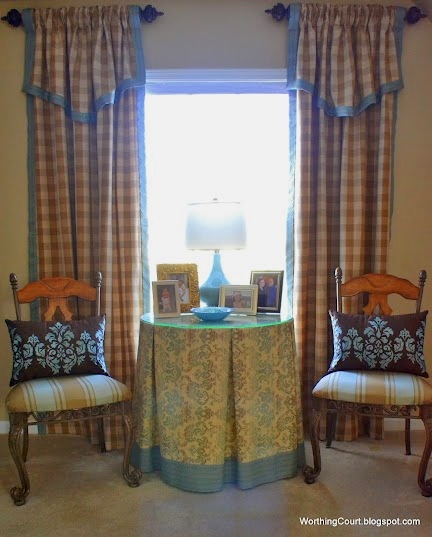 There’s an even better picture further down in this post of the curtains…you’ll love how she trimmed them out. Notice the lamps…they are a change to the room, also. I love the soft color scheme Suzy chose for her bedroom. The blue is so pretty with the cream and the luscious mocha browns. Suzy made her shams from the same frabric she used for her curtains. Shams are so expensive to buy, Suzy wonderful job and saved a bundle! In addition to the buffalo check curtains on either side of the bed, Suzy also made them for the other windows in the room, as well. They look great trimmed out in blue…such a great color combination. Here’s a side by side comparison of this metamorphosis. Beautiful transformation! Doesn’t this make you want to pull out your sewing machine? I haven’t used mine in so long, I’ll have to read the instruction manual again to remember how to thread it! Ha! I definitely want to do some more sewing…this has really inspired me to get busy. Be sure to stop by Suzy’a blog, Worthington Court to see the whole room transformation and her cozy reading nook, then scroll on down to see all the fabulous Before and Afters linked up for this week’s Metamorphosis Monday! Beautiful makeover. I love the fresh summer colors! That’s a fabulous makeover, and I love the buffalo check curtains and other bed dressing. Wonderful job! Suzy is a great gal! !…She is a very talented in making window treatments as her profession…The bedroom is beautiful and I am blessed to consider Suzy a friend….Great feature Susan! What a wonderful transformation!! Love the colors! Thanks so much for throwing such a great party! 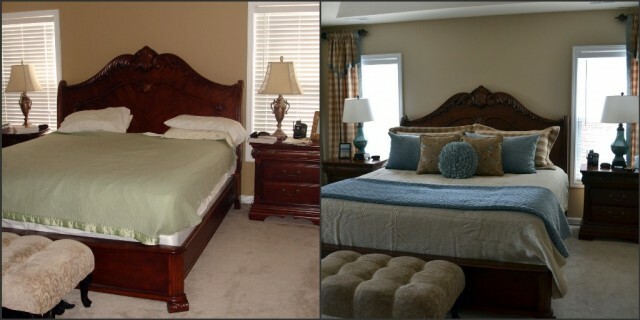 Love the differences in Suzy bedroom. What a deal she got on the fabric. I was at Jo-ann’s fabric store last week and would have loved to come across a deal like that. Still on the lookout for fabric for curtains for our home. Off to visit Suzy’s site. Thanks so much for hosting and have a fabulous week! 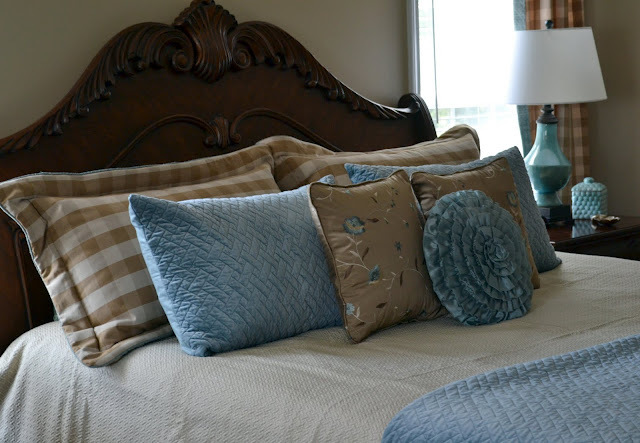 Suzy’s bedroom turned out great…who doesn’t love buffalo check? Thanks very much for hosting! Thank you Susan for the Party- so glad I could join today and share some tips I came up with for organizing the craft sewing space. Love the check curtains by the way! 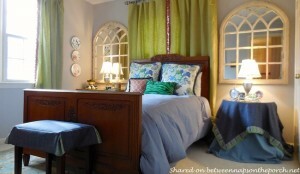 I love the window treatment, but I also love the bedding colors she chose to match the drapes and the pillows. Great! 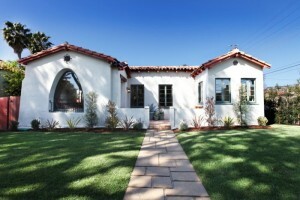 I love this color combination, Suzy did a fabulous job on this makeover. Beautiful bedroom makeover!! Love the color scheme. Thanks so much for hosting! This might have finally inspired to me tackle my bedroom. It’s so beautiful. Thanks for sharing. How fun to see the bedroom redo. Thanks for the party. I look forward to everyone’s posts. Thank you for the feature, Susan. And thank you for hosting your party every week too! Thanks so much for this great party! Another beautiful makeover Susan…thanks for hosting this fun Monday party too!! Beautiful makeover!Thank you for hosting! I just changed out the “curtains”–actually, just tablecloths–in my kitchen/keeping room. I used buffalo plaid, sort of like the check, only in 3 colors. I love them! I used a buffalo check recently when I did a Laundry room make over. I had no idea I was trendy but I love it. Beautiful results! Thank you for sharing. It is good to see what others have done and created in their homes. I need the boast. What a fabulous room makeover! Love the checked curtains too! I actually have some burgundy and white ones somewhere! Love, love, love them! Thank you for sharing… sigh! 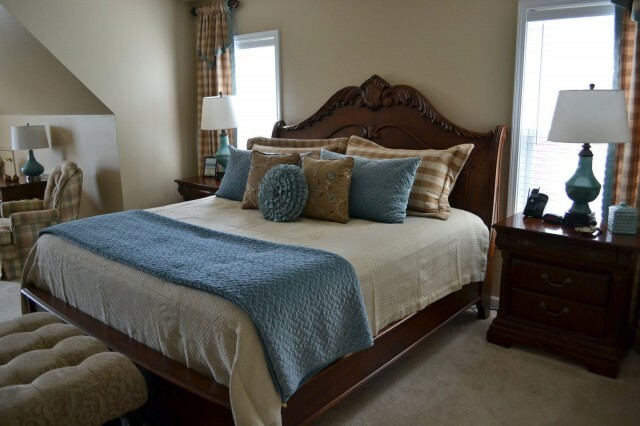 Suzy is a dear old GF and her bedroom is even more beautiful in person. Her entire home is so beautiful and welcoming. Great projects – Fave has to be that B&W Table, but also liked the Entry Redo, House For Sale Tour and the clever use of punch bowls for a sewing nook’s organization! Thanks for hosting! 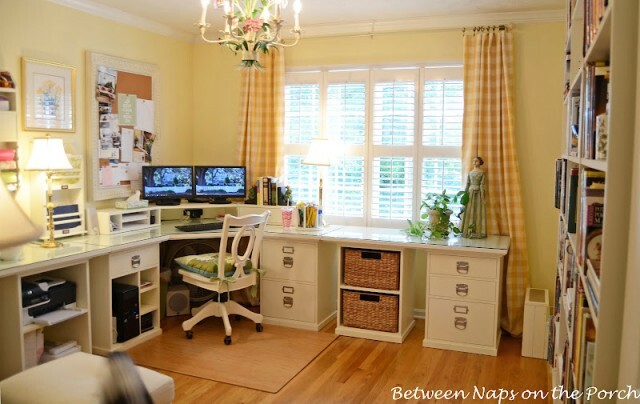 What a lovely and peaceful room she has created with mixing fabrics. I too, love the Buffalo Check fabrics and you girls are tempting me to make my own purchase. I can’t sew like Suzy-her window treatments are wonderful. Glad she shared her room with your readers! Hi Susan: I love your new bright curtains, and just wanted to let you know how much I enjoyed your post about your kitty Max last week. Take care, thank you for hosting the party today, and have a wonderful upcoming week! I had blue and cream colored buffalo checked curtains in my bedroom in the 1980’s. When we moved I packed them away and haven’t had a place to use them since but everytime I go through to “purge” things in the attic, I cannot get rid of them. I keep thinking one of my now grown children will want them for a baby boy’s room or another room. They are a classic look. Thannks for hosting your party for us! Thank you Susan, for hosting Metamorphosis Monday each week. It is so inspiring. I enjoy all your posts and learn so much from them. What a stunning room! I love buffalo checks and I’m so inspired to decorate a room in my own house with this fabric. Thank you for the lovely pictures and the inspiration they provide. Thanks too for letting us know that Old Time Pottery plans to have online services available in the future. I look forward to hearing who the lucky winner will be of their fabulous give-away. I’ll keep my fingers crossed until then, since my name is in the pot. Susan, thank you for posting this makeover. I have windows and furniture very much like Suzy’s but have never understood how to place those pillows! I am going to use her “after” photo as a template and do some changing of my own! I’m not a curtain person – I have all wooden blinds in my house but am going to seriously consider those Buffalo checked curtains! I’ll keep you posted.